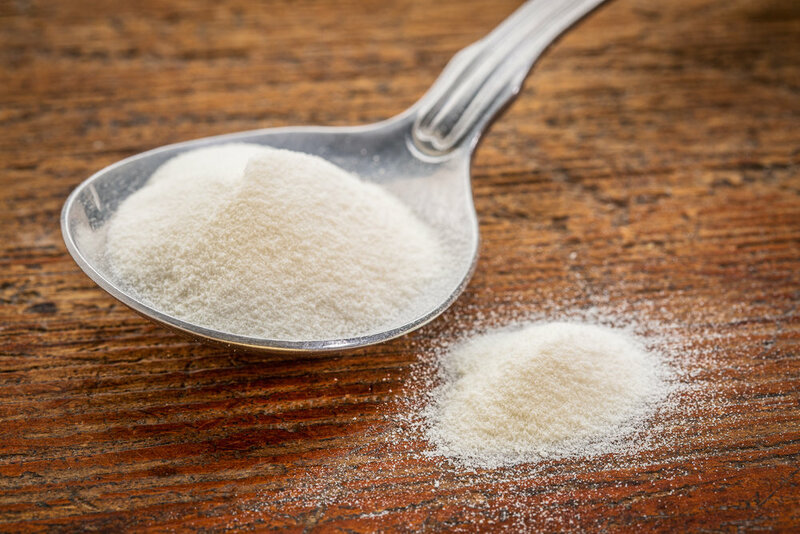 You may have seen the word collagen popping up lately in health and nutrition articles, but what exactly is it? Collagen is a special type of protein in the body that is particularly important in having healthy joints, skin, hair, nails, and digestion. According to natural medicine guru Dr. Josh Axe, "it's the 'glue' that helps hold the body together." Our natural production of collagen slows down as we age – even faster if we eat a high sugar diet or smoke cigarettes. The best sources of collagen can be difficult to find and incorporate into a healthy diet, as it’s derived from uncommon animal parts, such as the bones, skin and connective tissue. Consuming homemade or high quality bone broth is an excellent way to ingest collagen, but did you know that it also comes in powder form? My favourite brand is this Bulletproof Upgraded Collagen, which I order online at The Canadian Vitamin Shop. It dissolves easily into both hot and cold liquids, making it the perfect complement for tea, coffee, or even a green morning smoothie. It's never been easier to give your skin, hair, nails, joints, and tummy the quality collagen they've been craving. What are you waiting for? Carolyn Coffin empowers people to crave the foods that help them thrive. A former physiotherapist turned health coach and educator, Carolyn uses a unique blend of nutrition, lifestyle, and mindset coaching to help her clients feel their best. She works privately with people all over North America and offers an engaged online community and affordable group coaching through her website eatrealfoodacademy.com. Carolyn enjoys going for a run in the great outdoors, visiting her local farmers’ market, and living a healthy lifestyle with her family. With my patients, I always stress it is not knowledge that ensures good health, but action. Think about it — how many diet or self-help books have you read but never applied the principles to your daily life? Or worse, how many have you purchased and never opened? There is a myriad of theories, guidelines and information sources surrounding the nutrition and wellness industry. Sometimes it appears the more you read, the more confused you become. But the basic principles of healthy living are not rocket science. The baby steps taken today may result in giant leaps for your wellness in the future. Add 1.5 tbsp of Clear Marine Collagen + C in the water according to a recent study in The Globe and Mail it helps support bones, tendons, and arthritis, while other sources say it helps treat and prevent skin wrinkles. I also include Clear Recovery as a source of creatine and glutamine for energy and strength. Do 20 to 30 minutes of interval cardiovascular exercise or one hour of brisk walking on an empty stomach. This will reduce elevated morning cortisol levels and burn extra body fat. This habit is most important to prevent weight gain following a cheat day or while you are on vacation and remember your maximum number of cardio workouts (my preference and recommendation as the best choice is walking) is five days a week. Keep this rule in mind: when you eat more – move more! You can learn more about this here: Clear Medicine Weight Loss, Clear Medicine Weight Loss Group Program. Enjoy a smoothie each morning during the work week for breakfast. In a blender, combine whey protein powder, 1 serving Clear Fiber, and 2 tbsp hemp seeds with ½ cup berries and water or coconut milk (in the carton). Drink it on your way to work if you need to. Meet your basic supplement needs effortlessly by taking your omega supplement (2 caps New Concentrated Clear Omega – Marine Based Oils or 4 caps Pure Form Plant Based Omega – (I recommend this for all those over forty as it builds bone density and assists in heart health). A chocolate Clear Complete Shake – that contains a fiber supplement, multivitamin and whey protein meal replacement all in one. I also have a version that is whey free and other that is does not contain the multivitamin. Keep a large mason jar on your desk and aim to drink two to three of these jars per day. One or two filled with water and the third filled with 2 green tea bags and 2 lemon or ginger or hibiscus tea bags. Be sure to steep your green tea to allow the active ingredients to reach full potency. Eat your hormonally balanced dinner before 7PM to avoid weight gain, earlier is better. Remember that two-thirds of your plate at mealtimes should be occupied by veggies; one-third salad and one-third baked, steamed stir-fried veggies. The other third should be your protein (approximately 30 grams for women; 40 grams for men). Your fats may fall on top of your carbohydrate selections (as an olive oil or salad dressing, for instance) or be consumed within your protein selections. Don’t forget to add spice. It will lower the blood sugar impact of your meal and aid weight loss by reducing insulin. If you had a metabolic strength training session this day, then you have earned your starchy carbohydrates like quinoa, beets or squash (about ½ a cup or the size of your fist) with your evening meal. Avoiding starches at breakfast will aid appetite and craving control during the day while enjoying them in the evening will help to improve your sleep. Spend some time alone, even if it is just 15 minutes, to breathe deeply, meditate, ponder, review your goals or write in a journal to wind down before bed and collect your thoughts. Designate this time as YOUR time daily. This is the ideal time to replace zinc and magnesium – the two most common mineral deficiencies and I also suggest taking a supplement of melatonin now for most people over 40 as it helps to reduce stress hormone, boosts thyroid hormone, aids bone density and assists with growth hormone. It is also breast and prostate cancer protective. Aim to get to bed before 10 (or definitely before 11PM) in a completely darkened room for optimal recovery, and to maximize the release of melatonin and growth hormone. Most sleep experts agree that 7.5 to 8.5 hours a night is optimal. But some people may require more or less sleep than others. 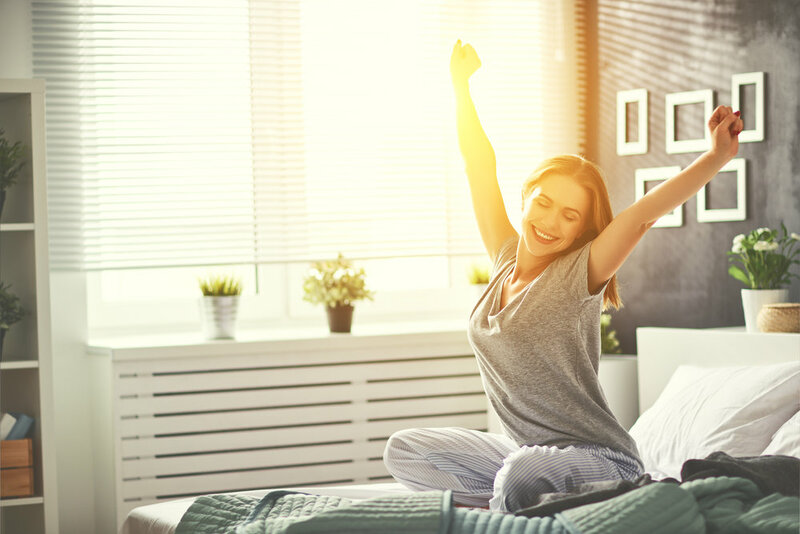 If you wake without an alarm and feel refreshed when you get up, you’re likely getting the right amount of sleep for you. Repeat the very next day and you will be well on your way to optimal (and hormonally balanced) health. Nothing gets you to dust off the running shoes and take the first step towards transformation after holiday festivities. If you’re looking to drop a few pounds, try these tips. The key to making change is preparing food in advance, so you’re less tempted to grab something from a vending machine or convenience store. Most healthy recipes allow you to swap the source of protein, whether it’s chicken, turkey, tofu, shrimp or lean organic steak. Once cooked, most proteins will remain fresh for three or four days, so cook them twice weekly in larger batches. How to: Another easy step is to make larger portions all in one day so you have three interchangeable meals for days to come. Warning: Egg dishes and smoothies would be an exception since they need to be fresh. I recommend keeping a food journal as, according to a large 2008 study, they’ve been shown to double a person’s weight loss. Getting and staying balanced requires you to be committed, organized and motivated. A wellness tracker such as this one is a handy weight-loss tool. In advance of your event, I also recommend reducing your intake of starchy carbs. This will reduce insulin, which aids weight loss and water retention. How to: You may choose to have a low-glycemic carb with a meal once per day, or not at all (and just receive your carbs from non-starchy veggies and fruits). Since insulin also controls sodium uptake in the kidneys and the levels of potassium and magnesium in the body, an excess will cause water retention and swelling. A recent study published in Nutrition found conjugated linoleic acid (CLA) supports weight reduction. Sixty- three subjects with a body mass index (BMI) of 24 to 35 received 1.7 grams of CLA or a placebo of salad oil in 200 ml of sterilized milk twice daily for 12 weeks. The researchers evaluated the subjects for body composition including total body weight, BMI, total fat mass, fat percentage, subcutaneous (below the skin) fat mass and waist-to-hip ratio at the beginning of the study and again after the supplementation period. They found that all markers decreased in the CLA group. How to: For a great fat burning combo, add 1-2 capsules of resveratrol in the morning on an empty stomach, along with two capsules (1500 mg) of CLA twice daily with a meal. Cayenne pepper is said to enhance metabolism, and therefore fat burning, by increasing thermogenesis: the production of heat in the body through calorie burning otherwise known as what makes you sweat when you eat spicy food. It also has appetite suppressing effects. One study showed that when added to the first course of a meal, participants consumed fewer calories later in the day. Combine the following ingredients in a large pitcher and enjoy it either hot or cold. It will increase your metabolism, lower insulin, support digestion and improve liver function. Infrared radiation heats the skin directly, similar to heat from the sun, but without warming the air. The radiant heat is safe, healthy and penetrates more than 1.5 inches into the body. Because the skin is the largest organ in the body, regularly sweating in an infrared sauna can help decrease toxic load and contribute to better health and vitality. A growing body of evidence suggests the accumulation of toxins in the body is responsible for fatigue, disease and weight gain. In a study performed by neurologist Dr. Dietrich Klinghardt, he found that the sweat of people using a conventional sauna was 95-97 percent water while the sweat of those using an infrared thermal system was 80-85 percent water, the non-water portion consisting of toxins including heavy metals. As an added benefit, one infrared sauna session can burn up to 300 calories. How to: Hit the sauna twice a week for a month before your event for glowing skin, less body fat, reduced cellulite, decreased pain, and better hormonal balance. L-carnitine is naturally made from amino acids lysine and methionine and is required by the body to release energy from fat and to transfer fatty acids across cell membranes to the mitochondria where it can be used as energy. It’s a great energy booster to take before cardio or strength training. It has also been shown to improve glucose disposal in type 2 diabetic patients. A separate review article published in the Annals of the New York Academy of Science concluded that L-carnitine and acetyl-L-carnitine, are effective in promoting healthy blood sugar and insulin levels. In one study, researchers fed mice a high fat diet in order to increase their weight. One group of mice were given carnitine while a separate group was given a placebo. The mice on carnitine gained less visceral and subcutaneous fat than their chubbier counterparts. How to: I recommend consuming 500-1500 mg per day separated into 1-2 doses either with or without food. Healthy eating doesn’t have to be hard. It’s just a matter of having the right information, doing a bit of planning, and being open to trying new foods. Here are some easy swaps you can make to get you started. It contains twice the amount of protein. Don’t be tricked into the no-fat versions. Fat is part of what makes our food taste good, and also helps to keep us full. If we take it out, then often more sugar is added to make it taste better, and we end up eating more food because we are still hungry. Look for a brand with no more than 10 grams of sugar in 125 ml. I suggest buying plain yogurt, and then drizzle it with honey or maple syrup to please adult and kids’ sweeter palates. If you need to be on a dairy-free diet for leaky gut or for anti-inflammatory reasons, try plain dairy-free versions like coconut yogurt or buffalo milk yogurt. Rice is great if you trying to eat gluten-free, but not if you are trying to lose weight. Once digested, one cup of rice contains approximately 50 grams of sugar. Compare that to cauliflower that only has 5 grams. Cauliflower is also going to have more fibre, vitamins and minerals overall. If you’re looking for a way to save time, you can pulse a few heads of cauliflower in your food processor all at one time (especially if they are on sale) and then freeze it using freezer bags. Then you can pull out a bag whenever you need it during the week. This was a great new discovery for people who love cream in their coffee. Many patients have reported drinking their coffee black just wasn’t the same. Blend your coffee with 1 teaspoon of coconut oil and a splash of pure vanilla, and then sprinkle it with cinnamon. 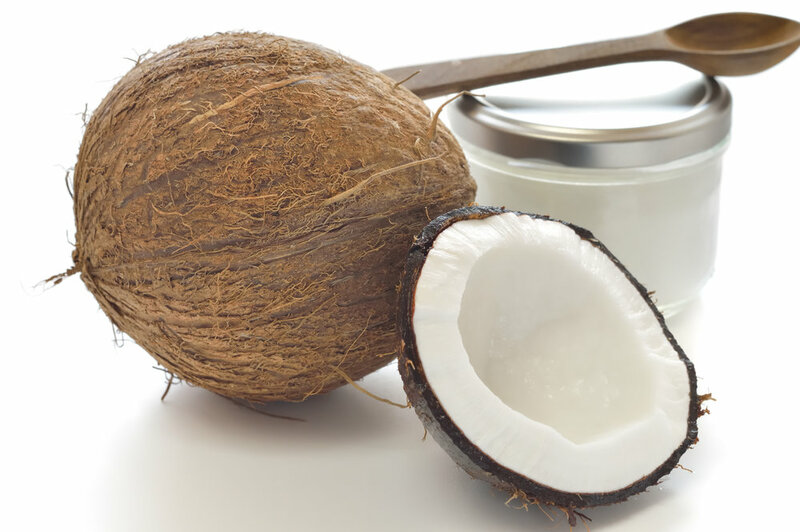 So tasty, plus coconut oil has lots of health benefits, and there are no artificial flavours or additives. This is for those of you who complain that water is boring, try a Soda Stream. It is super easy to use (just a few pumps of CO2 into the water), and a new CO2 cartridge only costs about $25 (one cartridge can last a year or more). If you like a bit of flavour, you can add some lemon or lime – either the real thing or an essential oil, or you can infuse a fruit of your choice. It’s so easy for breakfast and afternoon snacks to be really carbohydrate rich – that means we digest them quickly, spike our blood sugar, and then we crash and want something else to eat. Over the years, I have used various types of protein powders, and there are lots of good ones and not so good ones out there. For the last several years, I have been drinking medical foods like UltraMeal360, UltraInflamX360, and Synerclear (chocolate is my favourite flavour). Medical Foods are protein powders that treat specific medical conditions (eg. leaky gut, inflammation, liver toxicity, or insulin resistance). They are hypoallergenic and also replace your multivitamin. For patients who prefer to eat, rather than drink their breakfast, I have them switch to having their protein shake in the afternoon. If I am at home, I blend it with leafy greens, some berries and/ or a nut milk (almond milk or coconut milk are my favourites). If I’m at work, I just mix it with water in my shaker cup. Easy peasy – tastes great, fills me up and is super convenient. So, there you have it, five easy swaps I have found to make healthy eating easier. I’m sure there are many more great ideas out there. I would love for you to share what you have found has worked for you. So many people love to eat oatmeal for breakfast. Heck, I used to be one of them! It’s quick. It’s easy. It’s delicious. And its fibre content and cholesterol- lowering properties have earned it a reputation for being one of the healthiest and most virtuous of breakfast choices amongst modern health-conscious eaters. Oatmeal sure seems to have a lot going for it. So why did I give it up? Here’s what I’ve noticed, though. The oatmeal-loving breakfast crowd doesn’t abandon their morning bowl of mush at the drop of a hat just because some so-called expert hit them with a bunch of nutrition facts. Just hear me out for a minute. 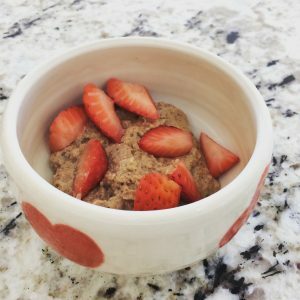 Imagine if you could recreate a morning bowl of mush that has the same look and feel as regular oatmeal, but with even more nutrients and virtually zero insulin-stimulating properties? Imagine this magical bowl of mush has the same great taste, but keeps the hunger pangs at bay all the way until lunchtime. Enter ... primal porridge. It’s just like oatmeal but without the oats. It’s no-oat-meal. Primal porridge is a delicious oatmeal substitute made out of nuts, seeds and banana. It can be prepped in the same amount of time as regular oatmeal – even less if you make a big batch of dry mix in advance. And the same standard toppings work well — such as berries, shredded coconut, chopped apple, nuts, and raisins. With all of this natural sweetness, even the brown sugar is optional. What do you have to lose by giving primal porridge a try (other than maybe a few pounds)? If you like it, please share it with your family and friends so we can spread the real-food-lover’s porridge recipe far and wide. It has the same look and feel as regular oatmeal, but without the oats. Place walnuts, pecans, ax seed, cinnamon, nutmeg, and ginger in food processor. Pulse to coarse texture (stop before reaching fine powder) and set aside. Tip: Make extra dry mix to use another day. Store in a sealed container and refrigerate (or freeze). Everyone needs to eat and we all should be able to eat enough nutritious, affordable, diverse food for good health. What could be more important than supporting the development of national policies that make that possible? In the fall of 2015, Minister of Agriculture and Agri-Food Lawrence MacAulay received a mandate from Prime Minister Trudeau to develop a national food policy for Canada. On May 29, 2017, the ministry launched an online survey (canada.ca/food-policy) to support the development of the food policy, encouraging Canadians to give input regarding a food policy that will cover the entire food system, from farm to fork. The online consultation closed on August 31, but during September, Canadians can submit their ideas directly to the food policy team, or can attend local and regional sessions aimed at understanding citizens’ priorities related to food. Go to canada.ca/food-policy to learn more about the federal government’s food policy process. Food Secure Canada (FSC), a national alliance of organizations and individuals working to improve food security and food sovereignty in Canada, is supporting the hosting of local events to discuss what should be in a national food policy. Go to foodsecurecanada.org and check out its food policy link for more details about how to get involved, responding as an individual or working to organize a local event to gather opinions and feedback of people in your area. Let your MP know that you care about the development of a broadly-based, effective national food policy that helps all Canadians eat healthy, and make sure the food policy is on his/ her agenda. As I said at the beginning, everyone needs to eat, and we all should be able to eat enough nutritious, affordable, diverse food for good health. What could be more important than supporting national policies that make the food system right for everyone? in restaurants and socializing with others — all without the comforts of home — can be a perfect storm for eating junk food, skipping workouts and staying up way too late. If this sounds like you, please know you’re not alone! Maintaining good eating, moving and sleeping habits while on vacation or away from home is one of the biggest stumbling blocks I hear about from clients. And I’ve experienced it, too. Luckily, there are some creative ways to feel well on the road. Pack a cooler and utensils. It may sound obvious, but access to healthy snacks can either make or break your experience. Fill it with whole foods that travel well like raw veggies, muffins, pancakes, energy balls, hard-boiled eggs, jerky, apple chips, cheese, Greek yogurt, trail mix, fruit and dark chocolate. Throw in some condiments like guacamole, salad dressing, mayonnaise and salsa for ready-made meals or snacks on a moment’s notice. Eventually you will have to eat at a restaurant. Do not panic. There are always healthy options, even if it means having to ask for them. Here are my favourite “special requests” at restaurants. Can you please hold the breadbasket? Ditto for croutons? Is it possible to have a grilled chicken breast instead of the breaded one? Do you have oil and vinegar dressing? And could I please have that on the side? As for staying active, try these tips. Get a hotel with a pool. Particularly for those with young children, this tip will keep you active for hours! Check out your hotel’s exercise room for a brief, high-intensity weight workout or long, slow cardio session. Checkout the city on a bike or on foot. Most cities now have affordable bike drops that allow you to do your own exploring on wheels powered by you. Or kick it back old school with a comfortable pair of walking shoes. It’s always surprising how much ground can be covered on foot. Once you know a few simple tricks of the trade, you’ll be able to return home from stints away feeling just as amazing as when you left. Mix all ingredients in food processor until paste forms. Form into bite-sized balls. Eat immediately or freeze to make them last longer! It’s that time of day again, when your craving for chocolate presents itself and nothing else will do. But with your fall health routine beginning to pairing back after summer– what can you do about it? Although cocoa is touted as healthy because of its antioxidant properties, most of us experience guilt or frustration when we give in to our cravings for rich, delicious chocolate. Well, feel guilty no longer, there may be a solution for you—and it’s as simple as a magnesium supplement that has no calories at all. But pay attention to your cravings! They are a very good sign magnesium is just what your body needs since chocolate is, in fact, one of our richest dietary sources. Studies have found, and my clinical experience has confirmed, that chocolate cravings and PMS symptoms improve with daily magnesium supplements. But that’s not all this mineral can help you with.... keep reading to discover the many benefits of magnesium. For a long time now, it has been suggested that chronic fatigue syndrome is related to persistent magnesium deficiency, which may improve with magnesium supplements. Magnesium is a wonderful mineral that is involved in over 300 enzymatic reactions in the body. When we are magnesium deficient, our bodily functions slow down at the cellular level, causing everything to become sluggish until eventually physical or mental fatigue eventually ensues. Individuals with anxiety have been found to have lower levels of magnesium. This may be linked to the fact that a magnesium deficiency causes the release of adrenalin. Also, other studies have found that magnesium supplements reduce the release and effect of stress hormones on the heart, which is an indirect measure of the mineral’s effect on the brain. In the elderly, magnesium supplements were found to improve sleep by decreasing the release of the stress hormone cortisol, which is known to cause sleep disruption. Magnesium glycinate (400 to 600mg) at bedtime is my favourite starting place for most cases of sleep disruption, for all ages. Ever get those irritating little twitches in your eyelid? Or maybe painful muscle cramping, waking you at night or ruining your workout? These are both possible signs of magnesium deficiency since it is closely involved in proper muscle relaxation and contraction. Try taking 200 to 600mg of magnesium at bedtime and you may be surprised at how quickly these symptoms may respond to your efforts. Athletes can be especially prone to magnesium loss from sweating. Meanwhile, an athlete prone to loose stools will have an even greater risk of deficiency. I once treated an adventure racer with this exact condition. He used to develop cramps so severe his teammates would have to carry him during competitions. I fixed his digestive issues, supplemented minerals and he was back in action in no time. I recommend mineral supplement containing magnesium and foods high in the mineral-like seeds, nuts and green leafy veggies to all of my athletes to maintain their performance. Evidence suggests that magnesium may play an important role in regulating blood pressure, due to its natural muscle relaxant ability. When blood vessels are relaxed there is less resistance to the flow of blood and as a result, lower blood pressure. The DASH study (Dietary Approaches to Stop Hypertension) suggested that high blood pressure could be significantly lowered by consuming a diet high in magnesium, potassium and calcium, and low in sodium and fat. In another study, the effect of various nutritional factors on high blood pressure was examined in over 30,000 U.S. male health professionals. After four years of follow-up, researchers found that a greater magnesium intake was significantly associated with lower risk of hypertension. The evidence is strong enough that the Joint National Committee on Prevention, Detection, Evaluation, and Treatment of High Blood Pressure recommends maintaining an adequate magnesium intake as a positive lifestyle modification for preventing and managing high blood pressure. Magnesium deficiency can cause metabolic changes that may contribute to heart attacks and strokes, while higher blood levels are associated with a lower risk of these conditions. There is also evidence that low body stores of magnesium increase the risk of abnormal heart rhythms, which in turn may increase the risk of complications associated with a heart attack. It appears a magnesium deficiency may also be a risk factor for osteoporosis. This may be due to the effect of magnesium deficiency on calcium metabolism and the hormone that regulates calcium balance in the body. I normally recommend 600 to 800mg of magnesium along with 1000 to 1200mg of calcium daily to all adults to treat and prevent bone density loss. Magnesium is important to carbohydrate metabolism. It may influence the release and activity of insulin, the hormone that helps control blood glucose levels. Elevated blood glucose levels increase the loss of magnesium in the urine, which in turn lowers blood levels of magnesium. This explains why low blood levels of magnesium are seen in poorly controlled type 1 and type 2 diabetes. These low levels of the mineral may also contribute to hypertension commonly found with many diabetics. Okay, if, after all of this fantastic news about magnesium, you just can’t get past your chocolate craving, then at least choose the best chocolate. Look for a minimum 70 percent or more cocoa solids. It’s the healthiest way to satisfy a craving for chocolate, without consuming all the sugar and saturated fat common with milk chocolate. Our fasting bodies change how they select which fuel to burn, improving metabolism and reducing oxidative stress. Today’s intermittent fasting regimens are easier to stick to, and proven to help excess pounds melt away. Studies have clearly shown that our bodies respond to fasting by boosting glucagon, adiponectin and growth hormone - the hormone that helps build muscle. A scientific review in the British Journal of Diabetes and Vascular Disease suggests that fasting diets may also help those with diabetes and cardiovascular disease. Intermittent fasting involves avoiding food intake for one day per week. During your cleanse day, you should drink at least four quarts of warm or cold herbal teas to support the cleansing process. I recommend a combination of herbs with anti- inflammatory and diuretic effects, such as ginger, lemon, blueberry, hibiscus, dandelion, green tea, and parsley. Alternatively, you can use an intermittent fasting support mixed into four quarts of water to drink throughout the day. If you feel overly hungry, you can consume one or two hard boiled eggs in the morning or a serving of nuts in the afternoon, but try to last the day. The benefits of fasting extend beyond just the 24 hour period, and it does get easier with time and experience. You can do this once every seven to ten days, or even more than once a week if you want to accelerate your plan. I recommend doing your cleanse days on Tuesday or Wednesdays. If you have your cheat meal on the weekend as so many of us do, this will give you a day or two of clean eating to get your insulin back in balance, lessen cravings and steady your appetite. will make cooking easier. Plus, you won’t be tempted to veer from your plan and get easy, premade food. I’ve also got a few kitchen tips that have made a difference in my life, and I’m excited for them to help you. • Replace iodized table salt with Celtic sea salt. This natural option provides trace minerals that are beneficial for your thyroid, adrenal glands, body hydration, energy and overall wellness. It is available for purchase on my website if you can’t find it at your local health food store. • Stock your kitchen with a high- quality organic extra-virgin olive oil (contained in a dark bottle) and an organic coconut oil. These are also available in spray form at most health food stores— the perfect means for lightly glazing pans with just the right amount of oil. • Buy low-sodium bouillon cubes, stocks and canned tomatoes. I also am a huge fan of fajita spice packs – President’s Choice is a healthy choice, and organic gravy mix from Simply Organic is great to have on hand for my Carb Craving Shepherd’s Pie. Also, tomato paste adds a great umami flavour or richness to food that you’re trying to keep low in calories and fat. Tomatoes, particularly tomato paste, are bursting with cancer-fighting lycopene. Use it to add an extra layer of flavour to curries and stir- fries. • Substitute Greek yogurt for sour cream. It is lower in fat and higher in protein. • You can enhance the flavour and depth of your meals without adding extra salt, using the acidity of vinegar (apple cider or balsamic) or lemon. An added benefit: vinegars also reduce the glycemic impact of your meals. • When slicing avocados, use a sharp knife to split them in half and remove the pit. Then, keeping the skin intact, cut it into slices. This creates perfect sections, which can then be easily removed from the peel with a spoon, for use in salads and other dishes, or placed on a cookie sheet for freezing. Once the slices are frozen solid, transfer them to a sealed container or freezer bag. • Maintain the crispness of fresh herbs by washing, rolling in dampened paper towels and placing in resealable bags before storing in your fridge. Some fresh herbs can be washed and stored in your freezer to extend their shelf life for up to one month. Once frozen, they can easily be defrosted and chopped before they hit the pan. • Frozen shrimp: Four large shrimp are only 30 calories and contain pure protein and virtually no fat. Shrimp also offer up a hefty dose of iodine. Buy them peeled and deveined so they can be easily defrosted and incorporated into last-minute weeknight meals. I love these because they are so versatile; they can be served hot or cold, in shrimp scampi, shrimp tacos, shrimp salad, etc. Plus, along with this, I love Barberian Steak Spice – to pan fry the shrimps to top salad or over zucchini pasta with tomatoes/ balsamic reduction. • Mustard: This condiment is packed with the immune-boosting mineral selenium and turmeric, a spice (that gives it its yellow pigment) with cancer-fighting properties. Keep a couple different varieties in your refrigerator, including Dijon, for salad dressings, sauces, marinades, and in a coating for breading chicken and pork. Grain mustard is another favourite as a spread on sandwiches. • Ground chicken and turkey: buying a lean ground turkey or chicken breast saves on saturated fat compared to ground beef. Stash in your freezer and thaw when ready to eat. It’s one meat that cooks in a zip and can be used in stir-fries, meat sauces, tacos, enchiladas, stuffed peppers, or rice bowls. • Toasted Seeds: Specifically black sesame, white sesame and raw pumpkin seeds. I keep these mixed in a bowl in my fridge to toss into salads, delicious mixed with ricotta cheese or even as a fast mouthful when hungry! Being organized and ahead of schedule in the kitchen is essential to making a diet update work. Eating and living healthy should be enjoyable, and with a little preparation plus the “TurnTash Method”, you should be able to eliminate the many things that make it feel like an obstacle. Below, I go over the essentials for your kitchen that will make preparing Hormone Boost-friendly foods more streamlined. I also like to recommend that as you put your delicious meals together, you try to keep your working area as clean and organized as you can. Staying mindful during this process will not only give you (or a loved one) less clean-up afterwards, but you will also feel more connection with what you are eating and be respectful of the effort you put in to prepare it. Plus, less clutter always equals less stress! Invest in a set of sharp chef knives. As surprising as it sounds, sharp knives are safer than dull ones since they are less likely to slip during use. And trust me: ready access to these essential tools will serve up simple satisfaction with every chop and slice. Already have a set, but they’re dull? Check out this Gordon Ramsay video on how to sharpen your knives at home. It’s easy! Add a bench scraper to your utensil drawer. While it sounds like a tool you would need in a carpenter’s kit, it’s considered by many foodies and cooks to be a kitchen essential. It is simply a rectangular piece of metal with a handle across the full width of one edge. It just might be the kitchen tool you never knew you needed—at least until you discover how useful it is. Use your scraper to transfer chopped ingredients from a cutting board with one steady swipe or crush garlic before peeling without the risk of cutting yourself. Become reacquainted with a retro kitchen staple—the Mason jar. These traditional glass bottles are perfect for storing soups and sauces and for making the on- the-go salad recipes included in my book. Rely on stainless steel and glass bowls. These are fundamental in any kitchen. I have them in many sizes (mini ones for holding spices and large ones for prep work). They last a lifetime! It’s an added bonus if you can find a set with lids, as they allow for easy fridge storage of dishes like salads or for marinating meats. They don’t have to be expensive, but if the set comes with plastic lids, make sure they are BPA-free. Search for a spiralizer. Want to cut your carb intake or free yourself from the belly bloat of heavy pasta dishes? A spiralizer is your secret weapon for making virtually carb-free zucchini pasta and offers creative ways to increase your veggie intake (think cucumber, carrots and beets) in salads. There are several variations available from the simple to the more advanced. Different blades give you different “noodles” and keep you excited about carb-free indulgences. Pick up a meat thermometer. A good meat thermometer ensures that roast chicken, beef and other meats are cooked through. Consider devoting one cupboard or drawer solely to the storage of your dry spices. Small glass jars are a perfect way to go—they’re easy to label and arrange, and readily available at your local dollar store. Once you have your storage options in place, many spices can then be purchased in bulk. No space inside a drawer or cupboard? An organized spice rack can be a nice aesthetic addition to your kitchen’s décor – check out these ideas on Pinterest. Healthy habits aren’t all about your body. I fully woke up to the link between environment and well- being two years ago, when my husband and I downsized from our house to a condo. Amid the chaos of half-unpacked boxes, I realized just how important an uncluttered and organized living space is. Our habits suffered because groceries were sparse, pots were MIA, dishes were still packed and our supplements were out of sight. We tripped into bed at night over piles of clothes and folded linens. And during the day, we felt worn out from the constant mental chatter of our to- do lists, and because we were simply unsettled. • You will be more successful and lose more weight. Organization heightens your ability to be mindful about what you put into your body. My own experience tells me that success begins with thoughts or ideas, takes shape with planning, organization and preparation, and comes to fruition with motivation and commitment to follow through. • You will make Hormone Boost– friendly food choices. Incredibly, a study from Psychological Science (December 2012) found that people who worked in a neat space for 10 minutes were twice as likely to choose an apple over a chocolate bar than those who worked in a messy office for the same amount of time. Clutter at work or home is stressful for the brain, which makes you more likely to resort (consciously or unconsciously) to coping mechanisms such as choosing comfort foods or overeating. Plus, kitchen decluttering, “detoxing” of hormone disruptors and organization of foods and meals (i.e., stocking up on nutritious foods, preparing protein-rich meal-on-the-go options and smoothies, prepping fruits and vegetables) will only help to ensure that you make Hormone Boost eating your reality. Convinced now? I certainly hope so. It’s obvious that paying attention to your surroundings pays off big time. Various chemicals and hormone disruptors are lurking in your environment and they can interfere with your boost. Therefore, our first step is to get rid of those nasty things, and the logical place to start is—no surprise—the kitchen. When it comes to starting any new personal health regimen, the kitchen is surely target number one. So many bad habits are formed—and fed— in this important spot in your home. It’s vital that you spend a bit of time in the kitchen, making sure there’s nothing standing in the way of your success. Let’s start with a list of foods you should never eat; in fact, I recommend that you remove them from your kitchen immediately to prevent further hormonal disruption. Once you’ve got a handle on your cupboards and fridge, the next step of your kitchen boost is to get rid of your plastic food storage containers and replace them with glass. In part two, we explore the essential tools any Hormone Boost-ready kitchen must have. By being proactive and prepared you’ll ensure success and minimize frustration.